Elizabeth’s hiking, climbing and skiing expeditions were her initial inspiration to begin a career in art. Over time, her experiences have made her intimately aware of the magic and beauty that is present in the natural world, and in painting she has found an instrument to convey her reverence for it. Throughout her career, Elizabeth has discovered what invigorates, captivates and entertains her is challenge. Therefore, while continuing to pursue her love of landscape, she has added still life and figurative work to her subject matter, and painting directly from life has become her predominate approach of choice. There are nuances in painting from life that push her to see at a more sophisticated level, keeping her process continually stimulating, engaging and rewarding, as well as expanding her range of expression when working from photo reference. While being primarily self taught, she attributes much of her success to the valuable influence of the prominent artists with whom she has studied, combining their guidance with her dedication to developing a style of her own. 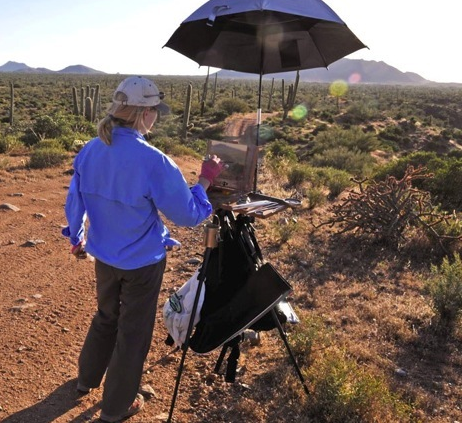 She has exhibited in numerous solo, group and juried exhibitions, has garnered international recognition and awards, and is in demand as a workshop instructor. Elizabeth is a member of the Oil Painters of America, and a signature member of the Society of Canadian Artists, the Canadian Society of Painters in Watercolour, and the Federation of Canadian Artists.